Gamba's website proclaims that it is the best seafood restaurant in Glasgow. But faced with competition from restaurants like Gandolfi Fish, Rogano and Crabshakk, that's a big pretty call. We ate there last night. Want to know what we thought? Well, you'll have to read on to find out! Gamba has a long history in Glasgow, but as a relative newcomer, I didn't know too much about it. I was really excited to go last night as I really love seafood and was somewhat overwhelmed by the choices on the menu. The restaurant is warm and welcoming and decorated with seafood artwork. You really feel like you're immersed in a proper seafood restaurant when you are surrounded with that many different kinds of fish and crustacean! Again, I was trying out my iPhone for the pictures, I think these ones look somewhat grainy but I will keep trying to perfect my technique! I was facing a very difficult decision between two starters, as well as two mains. Thankfully we had an incredibly helpful waiter who was able to paint a picture of the dishes to add to the menu descriptions. I was considering the sashimi, but when he told me that Gamba is famous for its fish soup, and it's been on the menu for the whole 13 years it's been open, then I had to have it. I can't remember ever ordering a soup as a starter before. Normally soup descriptions are so uninspiring that I just skim right over them. This however, caught my eye even before the waiter mentioned how popular it is. I really loved this soup, it was intense, rich and well balanced with lots of crabmeat as well as plenty of dumplings. I had expected the dumplings to be encased in a wonton wrapper (being my experience of soup dumplings) but these were lovely, petite balls of meat that added an extra bit of interest to the soup. Graeme isn't as big a fish fan as me, but is getting there eventually! As a result, he played it fairly safe with his first course and went for something he knew he would like. The crab tasted fantastic, and there were satisfying chunks of claw meat included to let you know you were eating proper fresh crab. The peppers worked great in conjunction with the mayo, and this was a nice refreshing way to start his meal. Unfortunately Graeme isn't the most delicate of eaters and ate all of the toast in about 3 mouthfuls, but he still had some bread left to mop up the rest! different types of cheese in the thermidor, I was sold. He also recommended the hand-cut rooster chips as the perfect side to mop up the rest of the cheese sauce - in my mind these were absolutely essential to the dish otherwise I would have been licking the plate! This dish is what my dreams are made of - delicate, light lobster smothered in a well balanced and heavenly cheese sauce. There was so much lobster as well, it was a really generous sized dish and I was perfectly stuffed when I finished eating it. Another relatively light meal for Graeme, but that certainly didn't mean that it was light on flavour. The almonds added a nice bit of crunch to the dish, and the supporting ingredients worked well together to enhance the relatively calm flavour of the bream. There was a good amount of prawns as well, which was good to see. The aforementioned chips - fantastic! Normally, Graeme jumps at the chance of having a chocolate dessert, and it's pretty much guaranteed that whatever has the most chocolate will be automatically picked. However, this one was picked with some trepidation, as strangely, he isn't a fan of nutella at all. He decided to take the risk, and we were certainly rewarded with a really tasty dessert. Without being overly filling, the chocolate had a great balance to it, and the nutella wasn't particularly dominant. For something with that much chocolate in it you didn't feel like it was a struggle to get to the end, and the pastry was really good also. Much fun was had spinning the ice cream in the sauce on the top of the tart, which added to the fun! 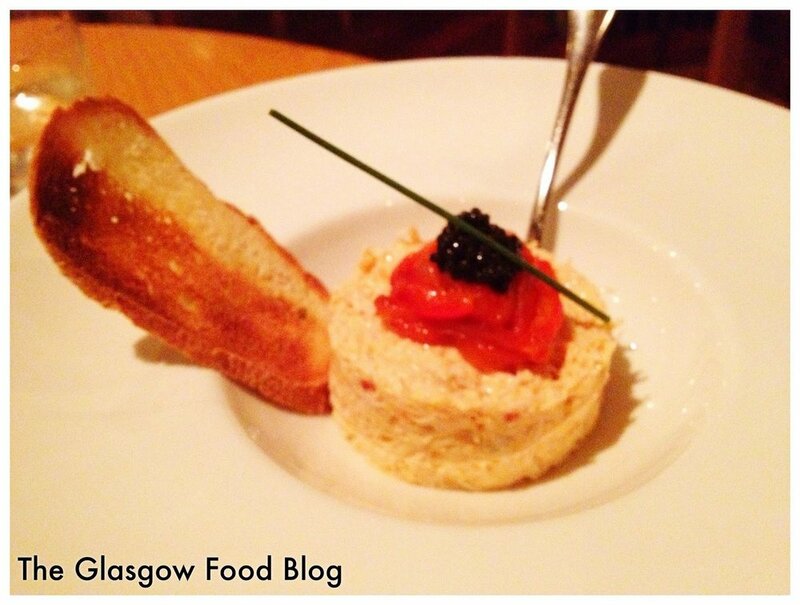 So, do we think that Gamba is actually Glasgow's best seafood restaurant? Well, it wouldn't be fair to say when we've not eaten everywhere. But we can definitely say that is the best we've eaten at so far, and I would highly recommend it - whether you're a seafood lover or not. With many thanks to Gamba, we have a cookbook to give away to a lucky blog reader! To enter all you have to do is comment on this post, and tell us what your favourite seafood dish is (links to recipes will be greatly appreciated!). Terms and conditions The competition is open from 17 October 2011 and will close at midnight on 31 October 2011. Winners will be notified by email and also posted on The Glasgow Food Blog on 1 November 2011. If the prize is not claimed by 15 November 2011, the prize will be re-drawn. The competition is open to readers worldwide. You can only enter once.